You can financially prepare for a divorce and the fiscal reality afterwards by taking the time to understand your current financial situation. Unfortunately, the standard of living goes down for most women going through a divorce. Even so, you can take steps right now to prepare yourself financially so that you can get by. The following article sheds some insight on financially preparing for divorce and gives some good tips on getting your budget in line. If you don't have an attorney, you can fill out this form for a free consultation with a qualified attorney in your area today. Divorce - I doubt any of us who have experienced it ever set out from the beginning of our marriage intending to get divorced. Now when I work with people divorcing, I find that potential divorcees often fall into two categories: those who have been preparing for the possibility of divorce, and those that are totally surprised upon receiving the news that their spouse wants to separate. No matter which category you fall into, there are important financial preparations to make. Whether you expected the divorce or not, there are usually significant financial changes ahead. Often I meet individuals who feel overwhelmed, confused, unsure of what to do, and powerless to control their situation. Step number one for any person thinking of divorce, or experiencing it, is to make a budget of your expenses and income, and compare how the two balance out. The fact that most people find making a budget to be about as much fun as the idea of shoving bamboo shoots under their fingernails is not lost on me. It is rare that I talk to people who live on a budget, or enjoy the idea of making one. However, this fundamental building block can be the first step to regaining control over your situation and restoring calm, at least to part of your emotions. If you are not used to working with the family budget, the task of creating a budget can be a good bit of work. It may be necessary to become familiar with the current family expenses first, and then look ahead to the future and ask yourself what will change. If you are remaining in the family home, the changes may be very minor. If you will be moving to a new residence, the entire budget may soon be quite different. With a budget, the easiest place to start is by listing your fixed expenses: cost of rent or mortgage, utilities, phone, cable, etcetera - all of the things that are regular expenses that are virtually essential to day-to-day living. After listing all of those items, then list the variable expenses - these are items such as entertainment, eating out, home repairs, shopping, and clothes - basically the items that aren't necessarily required but are normal expenditures during the month. The expense side of the budget is only part of the equation. 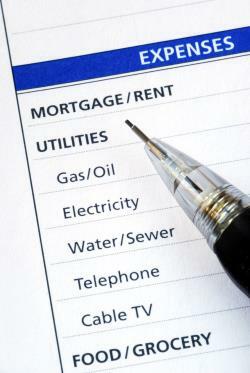 It is also essential to list out your income sources. In other words, where do the dollars to live on come from? Look for dollars from employment, from the other spouse as an initial arrangement for supporting the kids, a pension, investments, or perhaps rental income. Once both the expenses and the income have been determined, then it is time to compare the two. This is the critical point that often helps you work towards solutions. The big question is - are there enough funds to meet the budget, or is there a shortfall? Too often in divorce, unfortunately, there is a shortfall. This makes common sense if you think about it, since divorce usually takes the income and expenses of one household, and then requires that same income to support two households. Unless a family's income is large, with a lot of extra spendable dollars, some belt-tightening is going to be required. Even for families with seemingly high incomes, I find that the spouses will feel quite pinched at first, simply because most American families today are used to spending at, or near their entire income. If you are getting ready for, or are going through a divorce, and feel that dollars are tight, you should realize that you are not alone. Be careful of falling into the trap that many people encounter: knowing that money is short and continuing to overspend. This won't help solve the problem; in fact it makes it far worse. What will help rectify the situation is tightening up the budget. Think of it like a diet - it's rarely pleasant at first, but it is possible, and often it can have beneficial impacts in the long run. The first step if you discover the need for a financial diet is to look back at the variable expenses - the shopping, eating out, home or personal items, and the "fun" money. I mentioned that starting a financial diet isn't fun, and here's why: these are the first items that need to go. You need to take a hard look at these expenditures and ask yourself: are these necessary? Much like a diet, be careful of the overuse of rationalization. Do you really NEED that $4 dollar cup of coffee at your favorite coffee shop, or do you just enjoy it and find it more convenient? Do you really NEED to shop or buy things for the home, or is it just a habit that you enjoy? The reason that budget cuts in divorce are hardest is because they require us to cut out the things that added enjoyment to life - at a time when emotionally we're probably already short on positive experiences. Unfortunately, for survival, if the budget is short it is necessary to take these steps. But rest assured, sooner or later in life there are often ways to gradually add those enjoyment aspects back in. Often I will talk with individuals who have eliminated most of their discretionary spending but still find themselves coming up short in meeting their financial responsibilities. At that point, getting creative becomes necessary. Some simple ways to attack the problem are to look at some of those items we called fixed expenses, and see if the entire expense associated with them really is "fixed". For example, if the household has cable television, how many of the channels in the package are really watched? Could the cable package be downsized to something more economical that still provides most of what is actually used? Another good example might be your home phone service - are all the features really used, or are there call forwarding, multiple lines, or other services that really aren't needed. Adjusting services like these may only save $10 or $15 dollars each, but added up these savings can be significant. If the income still isn't enough to meet expenses after all of these reductions, then it becomes time to look at the income side of the equation to see if it can be increased. Are there income generating assets like stocks, bonds, CD's, or rental real estate that can be made to produce more income? Is a higher-paying career option available? Do you work part-time when full-time employment is possible? Sometimes hard realities of going back to work if you have stayed at home, getting a second job, or getting a roommate to share living costs must be faced. Perhaps it just isn't possible to keep the same home if that home is just too expensive to maintain. If there's not enough money to go around, the only choice is to cut expenses or increase income. Once you find a way to balance your income with your expenses, financial balance returns. There's a plan in place for how to meet life's expenditures. Control and power is restored over your financial situation. While the budget is just the very basic step to starting to survive divorce financially, it can answer a lot of questions and unknowns. There will certainly be other financial hurdles ahead: dividing assets, determining child support and perhaps marital support, perhaps even big items like selling homes or businesses, valuing pensions, and splitting retirement plans. But by having a plan to deal with the day-to-day financial life, it becomes easier to focus on other items that have yet to be done. Article by Michelle Ash is a Certified Divorce Financial Analyst™, Certified Financial Planner®, and Managing Partner of Paragon Wealth Strategies in Jacksonville, Florida. You can visit her website at www.WealthGuards.com. You can also read more Articles by Michelle Ash.